B.E (OUCE), M.Tech. 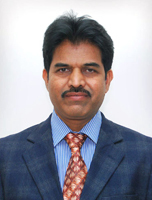 (IIT KGP), Ph.D.
Vice-Principal of JNTUH College of Engineering during April 2013 to March 2014, Head of EEE at JNTUH College of Engineering during September 2010 to September 2012 and also headed the EEE department at JNTU Anantapur College of Engineering during August 2008 to January 2010. Recently one project is awarded by DST of worth 51.6 lakhs and completed two research projects: (i) as a Principal Investigator, of worth 18.3 lakhs Design Robust observer based Intelligent A.C drive of AICTE and (ii) as Co-Investigator of ISRO in collaboration with University of Hyderabad. He has 120 research publications in International/ National journals/conferences to his credit. He has chaired many sessions in International/National Conferences and delivered more than 40 guest Lectures/key note addresses. He is involved in various committees as a part of administration. He has visited as visiting Professor to the Department of Electrical & Computer Engineering, University of Alberta, Canada towards collaborative research during May - Agust, 2007. Also he has visited USA , Malaysia , Thailand, Sweden, France and Itali as part of academic work and to present research papers in IEEE and other international Conferences. He is Fellow of Institution Engineers (India), Fellow of Institution of Electronics and Telecommunications Engineers, Senior Member of IEEE, Life Member of Systems Society of India and Life Member of ISTE. He is editorial board member to Journal of Computer Science (India). He has guided Five Ph.D students and eight scholars are under progress.